There are many occasions in life when words of encouragement, love, gratefulness and sincerity would be of an extremely urgent need. Sometimes people feel hard to say some beautiful words and here come these congratulations quotes. Special, warm, sincere words are of a great value nowadays. Use them to please your friends or relatives but don’t forget to smile! When a baby is born, it’s a huge event. But when twins are born, it is a great blessing! May you are always successful! A birth of a baby is a huge event. And so there should be the most vivid and cheerful congratulations. Getting new job is a perfect event to celebrate and get congrats! Congratulations on creating a new family should always be special. The new job is like a starting new life. Congratulations should give inspiration and hope. By congratulating somebody, we make them feel special and unique. These great words could be said as congratulations on birthday or on graduation. Congratulations on huge and marvelous success. Don't hesitate to share with the people you want to talk. May you do better in the future. Becoming grandparents is a great happiness! It’s very important that we have people who believe in us and encourage us for our further development. Make a young couple know that you are happy for them. Congrats and best wishes for a promising future! It is always a great pleasure to say some beautiful words about love to a loving couple. One special day to congratulate everybody is Easter. Buying a house is a huge step in everybody’s life. It’s worth celebrating. Best wishes to our friends and relatives. It is great to succeed and receive congratulations on this occasion. Graduation is an important step in everybody’s life. And it’s time when we need encouraging and wise words so much! New Year is considered to be the next chapter of our lives. 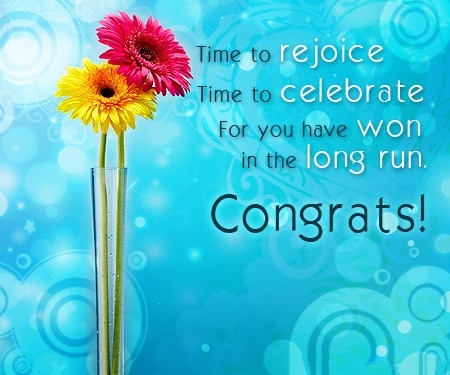 This one of congratulations quotes can be used for any occasion, whether its birthday, angel’s day or any other celebration. 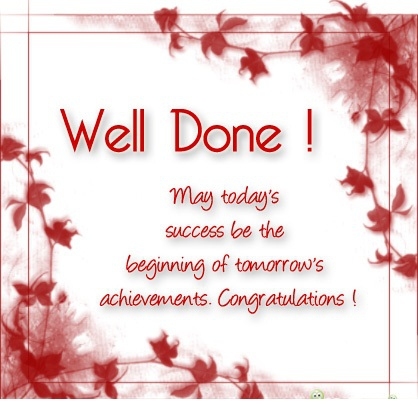 Congratulations to success are always encouraging.